It’s the day before a foul tip off the bat of Rajai Davis will fracture Francisco Cervelli’s hand, and the Yankees’ still-intact starting catcher is in excellent spirits. After spending almost all of 2012 in the minors, he’s happy to be back in the Yankees clubhouse. He’s also happy to be off to a good start with the bat, a start that’s about to get better; in a few hours, he’ll take Mark Buehrle deep for his third home run of the season. But how Cervelli hits is secondary, even to Cervelli. Instead, they stuck with two players who are earning barely more than the major league minimum. And they’ll probably be better off. Cervelli and Stewart can do more to help the Yankees win with a subtle shift of the glove than Mariano Rivera can with his cutter, than Brett Gardner can in the outfield, than Ichiro can with his arm and his base-running ability combined. They have an ability that not only doesn’t show up in the box score but doesn’t show up in advanced stats like UZR and WAR. Baseball teams have always known it existed, but they haven’t known what it was worth until now. And one need only look at the lineup card to see how valuable the Yankees believe it is. They’re both four-seam fastballs thrown by right-handed pitchers to left-handed hitters. They both pass through the strike zone 21 inches off the ground, between 11.7 and 12.9 inches from the center of home plate. They both hit their targets, so the catchers know where they’re headed and have time to prepare. And they’re both called by the same umpire, Sam Holbrook. In fact, the two pitches are similar in just about every respect but their outcomes. The top one, thrown by James Shields last July, is a strike, but the bottom one, thrown by Liam Hendriks last June, is a ball. We can’t say for sure why only one was a strike; maybe Holbrook was just feeling generous when the first pitch crossed the plate. But we do know one important variable that differs between the two pitches — the catcher. The pitch on the top was caught by the Rays’ Jose Molina, one of baseball’s best receivers. The pitch on the bottom was caught by the Twins’ Ryan Doumit, one of the worst. And that may have made all the difference. Focus on how catchers “frame” pitches to make them look more like strikes, or talk to guys who are good at it, and the distinction between players like Molina and Doumit starts to stand out. Depending on how they’re caught, two pitches that are almost identical on their way to the plate can look a lot different once they get to the glove. Concentrate on the catchers in those clips. Molina sets up farther outside, so even though the pitch to him is farther from the plate, he catches it in the center of his body. Doumit has to reach for the ball, drawing attention to its distance from the strike zone. The bases are empty in both clips, giving the catchers the freedom to set up any way they want without worrying about base runners. But only Molina goes down to one knee to present a lower, more stable target. Doumit’s head jerks sharply downward the instant after he catches the pitch. Molina’s remains still. And Doumit’s glove, descending to meet the pitch, dips even more after he catches it. This sends the ball farther outside the zone and forces him to jerk the glove back up in an exaggerated fashion. Molina’s glove never gets any lower than it is when he receives the pitch. He makes a much more subtle upward movement, and it takes about half as much time for his glove to come to rest. Although the changes in camera angle and batter position make it difficult to tell, these pitches are even closer together, according to PITCHf/x: 1.26 feet and 1.29 feet from the center of the strike zone, respectively. Both are four-seamers on 0-1 counts called by umpire Mike Winters. Again, we see the call go one way for Molina and the other for Doumit. And again, it’s not tough to tell why. Doumit’s whole body leans toward the outside of the plate, while Molina’s stays almost perfectly still. Doumit raises and clenches his right hand, creating a potential distraction for the umpire; Molina’s right hand remains tucked behind him. Doumit’s head and glove again dip before his pronounced pull. Molina times his reception to catch the ball with his glove already on the rise. Once you train yourself to see it, it’s almost impossible to stop seeing it. Baseball is often described as a chess match between batter and pitcher. But it’s more like a chess match between batter and pitcher in which, once in a while, the catcher grabs the board and moves someone’s piece. In a September 2011 article titled “Spinning Yarn: Removing the Mask,” Mike Fast, then an analyst for Baseball Prospectus (and now an analyst for the Houston Astros), attempted to determine what catcher receiving was worth. By studying where strikes are typically called and establishing which pitchers were getting more or fewer strikes than they “should” have, given where their pitches crossed the plate, Fast was able to isolate the effect of the catcher. He concluded that pitch framing can make a major impact, and it also is more consistent from year to year than even reliable offensive metrics like on-base percentage or slugging percentage. In other words, it’s not insignificant, and it’s not just noise. It’s a valuable skill that persists from season to season. Fast found that Molina, the best receiver, was worth 35 runs above average per 120 games, and Doumit, the worst, was worth 26 runs below average. After Houston hired Fast, another analyst named Max Marchi succeeded him at Baseball Prospectus2 and brought with him a sophisticated model for framing that accounted for most of the potentially confounding factors: the umpire, the ballpark, the batter, the ball-strike count, and the pitch location and type. According to Marchi, who has consulted for a major league club and whose work has been mentioned by Rays manager Joe Maddon, Molina has saved his teams 111 runs — or, using the standard 10-runs-to-a-win conversion, about 11 wins — because of framing from 2008 to 2013. (The only other catcher with a higher run total over that same time period, Brian McCann at 122, has caught more than twice as many pitches.) Doumit, on the other end of the receiving spectrum, cost his teams 155 runs. That comes out to 0.50 runs added by Molina and 0.55 runs subtracted by Doumit per 100 pitches, an enormous difference.3 For comparative purposes, Barry Bonds’s bat during the 2001-2004 seasons, when he basically broke baseball, was worth about 0.78 runs above average per game. Still, consider the implications. Giancarlo Stanton, one of the most coveted young players in the game, was worth as much4 (in terms of Wins Above Replacement) over the past two seasons as Molina’s framing alone was worth in a part-time role over the past five-plus, yet Molina’s value, unlike Stanton’s, is largely overlooked. And that’s without factoring in any value Molina added by calling games, handling his pitching staff, and controlling the running game. Best of all, Molina’s done it all for an average of $1.5 million per season, in an era when a single win on the free-agent market usually runs teams around $5 million. It’s no surprise that Molina plays for the Rays, low-payroll competitors who’ve found ways to make a dollar go further than any other organization. Nor is it a coincidence that Molina, a career backup catcher whom standard sabermetric stats peg as a replacement-level player, became a first-time starter and appeared in a career-high 102 games in his age-37 season, barely six months after Fast’s study appeared on Baseball Prospectus. “If a catcher can perfect a great way of receiving the ball, and he gets the ball maybe a half a ball outside — or even a ball outside — off the corners consistently, I think he’s worth his weight in gold,” says Steve Yeager, a 15-year big league veteran and the Dodgers’ catching coach. Molina is listed at 250 pounds, so depending on the karat, his weight in gold would be worth much more than he’s making. But even a 24-karat Molina wouldn’t go for as much as Marchi’s model suggests he’s worth to a team. It’s not as if receiving skills weren’t valued when Yeager was playing; as more than one person (OK, almost every person) I spoke to pointed out, the word “catch” is right there in the name of the position. But it’s easier to discount a certain skill when there are no numbers attached to it. (Just try to talk to the more dogmatic species of stathead about clubhouse chemistry.) Before framing became a sabermetric buzzword, Molina’s receiving skills were known but nebulous. His offensive struggles, on the other hand, were easier to see, and almost as easy to quantify. But now that we can count his contributions on both sides of the ball, what he does on defense is impossible to dismiss. The Rays, a team that’s smart enough to see that, are reaping the rewards (and so is Molina, though it’s a little late for him to cash in). Jose’s younger brother Yadier and retired older brother Bengie share(d) his receiving skill to a lesser degree, and all three inspire awe from their peers at the position. “I think the three Molinas, they come from another planet,” says Yankees catcher Francisco Cervelli. “I’ve never seen anything like that in my life.” But as many Molinas as there are, they’re not a renewable resource. At some point, the last Molina will retire, and if receiving skills are still undervalued among major league catchers, a team that could learn to teach framing efficiently at the lower levels, minting Molina-like receivers while other teams are still running out Ryan Doumits, might have its hands on a major market inefficiency. Thanks to advances in technology and analysts like Fast and Marchi, we have a much better sense than before of what a catcher with good receiving skills is worth. We also know which big leaguers qualify as the best in the business. What we don’t know, necessarily, is where good framing catchers come from. Are good receivers born or made? And if they’re made, how do you make them? Video is widely available through the minors, but the pitch-tracking technology that has made the Molina name more famous has penetrated only so far. According to one front-office source, about 40 minor league ballparks have a PITCHf/x system installed, and about 25 are equipped with Trackman (a competing ball-tracking technology that relies on Doppler radar). Around 20 of the 30 parent clubs have at least one affiliate with one of the two systems in place, with the highest concentration at Triple-A. The teams pool much of the information that’s collected; the more of your own PITCHf/x or Trackman data you elect to share with others, the more you receive in return (although clubs generally keep info from non-league events held in their stadiums — workouts, high school and college games — to themselves). That’s not really a problem, because the search for good framers, like almost every other pursuit in the modern front office, works best with input from both stats and scouts. Over small samples, an experienced scout or instructor can tell you more about someone’s receiving skills than a computer connected to a camera can, especially at levels where it’s more difficult for catchers to frame pitches because the pitchers can’t hit the target consistently. Opinions vary on exactly how long it takes to evaluate a catcher’s receiving skills, but the consensus is that the assessment comes quickly. That snap judgment is just the start. Once you’ve acquired a catcher with some raw talent for framing, the real work begins. There’s no one-size-fits-all plan for grooming great receivers — and not every catching instructor agrees on the proper way to receive pitches — but there are, generally, two types of improvements a player can make. There’s the mechanical change, which can be adopted immediately, and the incremental increase in comfort and confidence that comes with experience, repetition, and familiarity with a pitching staff. Bullpen drills are a big part of that repetition. Pitching machines can simulate any type of pitch, at any speed, in any location, and apprentice pitch framers exhaust all the possibilities. The drills aren’t a time to fill your quota of practice pitches and move on to something more interesting. They’re a time to concentrate and consolidate lessons. Eventually, all of this pays off in game action. If it sounds a little monotonous, well, it is. That’s another reason why, even if decades down the line every place where baseball is played comes pre-installed with a PITCHf/x (or FIELDf/x) system, there will still be a role for scouts. No matter how all-seeing the eyes in the sky above ballparks become, teams will still need to know what’s going on inside their players. Character and work ethic are at least as important in determining whether a catcher reaches his ceiling as a receiver as it is in determining how good a hitter he’ll be. Being born without the hands of a Molina brother is a handicap, but it’s a handicap that can be overcome. Now that teams know what a great receiver is worth, and players know that they know, both sides have more incentive than ever to focus on framing, both before and after each backstop’s big league debut. Brian Cashman has never known the feeling, but there’s a certain freedom that comes with being in charge of a bad baseball team, especially one that isn’t expected to be good. Unburdened by the constant pressure to minimize risk and construct a competitive roster that accompanies a club like the Yankees, losing teams led by creative executives are able to experiment and innovate. If you’re going to be bad no matter what you do, you might as well try to be bad in a way that will make you better eventually. That’s what we’re seeing with the Astros, a rebuilding club that’s currently making the Marlins look like big spenders. Rather than risk jeopardizing their long-term potential by trying to strike a balance between rebuilding and respectability, the Astros decided to raze their roster, trading every veteran who wasn’t tied down and spending hardly anything on free agents. It’s a path that has led to a lot of losing, with much more to come. But it’s also allowed the Astros to completely start over, in just about every capacity. They’ve restocked a formerly barren minor league system, climbing from 26th to ninth in the Baseball Prospectus organizational rankings in a single season. They’ve blazed new trails in pitcher usage patterns and defensive shifts. 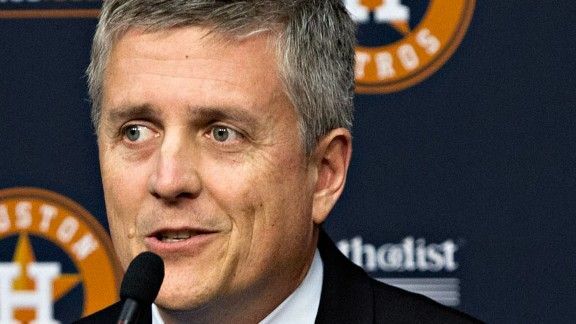 And led by GM Jeff Luhnow, they’ve assembled a new-school, cross-disciplinary front office with intellectual talent drawn from atypical baseball backgrounds. One member of that front office is Mike Fast. And as you’d expect, given Fast’s focus on framing before he was hired, the Astros are exploring ways in which they can make receiving skills a strength. You can’t see that effort reflected yet at the major league level; backup catcher Carlos Corporan is about average, according to Marchi’s model, and starter Jason Castro is somewhat worse. It wouldn’t matter much, anyway. A few extra strikes in the majors right now wouldn’t make the Astros’ immediate outlook any less hopeless. It’s below the surface where Houston’s framing future is taking shape. That’s where the Astros are seeking out the potential benefits of developing strong receivers before they reach the big league level. By stocking the minors with good framers, the Astros could accelerate their pitching prospects’ development or make them more attractive to other teams by bolstering their stats with catchers who earn them extra strikes. With the catchers themselves, Houston can simply wait until Castro and Corporan enter the arbitration process and start to make more than they’re worth, at which point they can promote those prospects. By the time the Astros decide to make winning at the big league level a priority, they could have a few catchers capable of expanding the strike zone. They may have put the first phase of that plan into action when they acquired Double-A catching prospect Max Stassi, a 22-year-old with a reputation for strong receiving skills, in the February trade that sent Jed Lowrie to Oakland. The man tasked with overseeing the receiver assembly line is Mark Bailey, the former Astros catcher and bullpen coach who accepted a new position this season as the club’s roving catching instructor, and he couldn’t sound more excited. The 51-year-old is a recent convert to the church of pitch framing, and he’s eager to spread the word. Bailey has seen the research and the stats, and he’s also studied what the catchers who produce the best stats look like. Fast and Astros director of decision sciences Sig Mejdal have sent him video comparing good receivers like Jose Molina and Jonathan Lucroy with subpar receivers, and the visuals made a major impression. That eureka moment made Bailey reevaluate what he looks for first in a catcher. The next stage is implementing a development strategy designed to make the most of each catcher’s receiving skills, and there appears to be buy-in at all levels of the organization. Jeff Murphy, a former minor league backstop who spent 12 seasons as the Cardinals’ bullpen catcher and catching instructor, followed Luhnow to Houston, where he’s serving in the same role this season. Although Murphy stresses still-intangible aspects of catching — like handling a pitching staff and calling games — to a greater degree than Bailey, it’s clear that he considers receiving skills important. Maybe a little too important, if you ask his exhausted pupils. If you take the Astros’ plan, and Manwaring’s comment about copycats, to their logical conclusion, then at some point in the not-too-distant future, almost every team — save, perhaps, for a few with gifted offensive catchers for whom framing aptitude is less paramount — could have someone squatting behind the plate and stealing extra strikes. But sweeping changes to the sport rarely come without unforeseen consequences. That kind of mass movement toward catchers with strong receiving skills would upset the delicate balance between batter and pitcher; if you think baseball’s strikeout rates are high now, wait until the first wave of Stepford framers arrives. 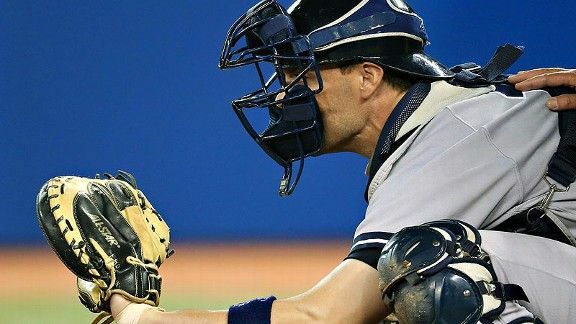 If umpires start to see nothing but good receivers, they might adjust their zones, much like a hitter adjusts to a pitch he’s shown too often. Then the framing bubble would burst, as previous advantages have when every organization discovered them. It’s also possible that a greater awareness of framing could hasten the end of umpiring as we know it. The discovery of framing has opened up a new field of research for authors and aspiring sabermetricians, but what’s good for baseball writers isn’t always good for baseball. Even if the intent isn’t to criticize umpires, it’s impossible to write about framing without drawing some attention to the fact that the rulebook strike zone is more of an abstract concept than something that exists in the wild. The more attention that the catcher’s ability to influence the strike zone receives, the more likely it is that Major League Baseball will act to automate it. And if the human element goes, replaced by robo umps, then framing will go with it. The calls might be more accurate. But we’d lose the art that is a perfect frame. Cervelli’s stats suggest that the work has been worth it. From 2009 to 2010, his receiving saved the Yankees 6.3 runs in 979 innings. But from 2011 to 2013, looking much more quiet behind the plate, he’s saved the Yankees 16.6 runs in 459⅓ innings — more than twice as many runs in less than half the playing time. Cervelli was an infielder and a pitcher before the Yankees signed him out of Venezuela and converted him to catcher, so he faced a steeper learning curve than most professionals. But he’s living proof that receiving skills can improve over time if accompanied by proper coaching and a desire to improve. The market-induced demise of framing might arrive one day, but it’s not here yet. Careerwise, this is the best time in baseball history to be a solid receiver. Framing is Chris Stewart’s meal ticket, too — he’s saved 16.5 runs in a little more than 8,000 pitches — and he’s well aware of it. It’s early in the season, but it’s not too soon to assess the Yankees’ Cervelli/Stewart experiment. Through the game in which Cervelli was injured, the pair had combined to catch 1,792 called pitches and saved the Yankees a little more than five runs in the process. If we extend that to the number of called pitches Yankees catchers caught last season, their total contribution comes to 36 runs. A.J. Pierzynski’s extended total over the entire season has him costing the Rangers roughly seven runs. He might outhit Cervelli and Stewart, but not by nearly enough to make up for a framing disparity that size. Even if he came close, there would still be the not-so-small matter of his salary, which is almost six times higher than Cervelli’s and Stewart’s put together. Runs are runs, whether they’re scored or saved. Now that we know how many runs Cervelli, Stewart, and others like them are saving, those former fringe players have become commodities that every team wants. Ben Lindbergh is the editor-in-chief of Baseball Prospectus. This is his first piece for Grantland. If not for that constraint, the Yankees could have simply re-signed Russell Martin, who inked a multiyear deal with Pittsburgh. We know when pitchers have gotten more or fewer strikes than expected, but the smaller the sample, the less certain we are that those strikes are entirely attributable to the catcher. To estimate a framer’s true talent over a modest sample, we’d want to regress his observed performance somewhat, just as we would with any stat. The runs-saved totals reported here are unregressed. Marchi’s model minimizes the need for regression by accounting for many of the non-catcher factors that can affect calls, and because we’re looking at large samples for catchers like Molina and Doumit, we can be confident that their reported performance reflects reality. But values from a single season are a little less reliable. In actual baseball, that is; in fantasy baseball, Stanton is still a star, while Molina is mostly unowned. Framing isn’t a fantasy category, so it’s not something you need to take into account when acquiring a catcher for your own team. But framing does have fantasy implications: When acquiring a pitcher, it makes sense to consider how good a receiver his battery mate will be. See Hundley, Nick. About Hundley, Towers says, “He stood up so high he would block the umpire from a lot of the low strikes, and it was just frustrating.” Marchi’s model rates Hundley’s framing as below average overall, but particularly bad during Towers’s last two seasons in San Diego (2008-09), when his receiving cost the Padres 23 runs in just 138 games. Marchi’s stats suggest that Ellis still has more work to do: He’s more than 30 runs below average since the start of his career, though he’s shown some positive progression. Between Ellis and backup Ramon Hernandez, who rates below everyone but Doumit, the Dodgers are costing themselves a lot of extra strikes. Disclosure: I am the editor-in-chief of Baseball Prospectus. If you’re still skeptical, this research might alleviate any lingering doubts: Mitchel Lichtman, a noted sabermetrician who was initially skeptical of Marchi’s results himself, checked to see whether the pitch-framing skill revealed by Marchi’s model was reflected in the performance of each backstop’s battery mates. He found that pitchers had significantly higher strikeout rates and lower walk rates when throwing to skilled framers. The expected difference between the “good framers” and “bad framers” Lichtman studied, according to Marchi’s results, was 0.29 runs per game. And the actual difference Lichtman discovered? 0.33 runs per game. For now, at least. Marchi is preparing to publish a method for estimating the framing performance of minor league catchers from pitch-by-pitch data (i.e., balls and called strikes). It won’t be as precise as the PITCHf/x-based approach we’ve been discussing so far, but it will offer an alternative (or complement) to the eye test.